Ever since the institution of formalized prayer there has been anxiety about the impact of that decision. “When one makes his prayer fixed it is no longer a supplication” (Mishnah Berakhot 4:4). The implications are educational as well as theological. Educating to the formal structures of tefillah functions as an important gateway to socializing the student into an adult community of Jewish prayer, but the more we focus on that important element the more we constrain the individual expression and the internal prayerful experience. Pushing schools and individuals of various stripes beyond their natural comfort zones can be extremely fruitful but is risky. Nearly twenty-five years ago I experimented in the Modern Orthodox high school in which I taught. For three weeks at a time I pulled out small groups, twenty students at a time, for an intimate, “alternate,” tefillah. We explored trimming pesukei dezimrah to its bare halakhic requirements (allowing for more contemplative time, attention to the words, and discussion), saying certain tefillot out loud in English, guided imagery in preparation for tefillah, eliminating the repetition of the Amidah (while making sure to say kedushah together), and more. Some students loved it and requested to stay on, others found it curious and interesting but not something they would want to continue, and some were so uncomfortable with it that they started to call it “the church minyan” (a name which stuck). Many of the articles in this issue struggle with the same question, often using the popularized terminology of keva vs kavvanah. Hillel Broder, Phil Keisman*, Seth Korelitz, Susan Marx, Peter Stein, and Ariel Wolgel* all discuss approaches they have taken to inject meaning-making into tefillah. Ziva Hassenfeld*, Russel Jay Hendel*, Saul Kaiserman*, and Joshua Ladon focus on tefillah literacy, each from their own unique perspective, while Chaim Feuerman* describes an attempt to make tefillah dignified. Daniel Rose surveys a range of different types of schools to explore what might be appropriate in different communities and age groups. Lisa Exler and Sharon Freundel describe school-wide approaches designed to address issues of tefillah literacy alongside meaningful tefillah experiences. As important as this question is, it is certainly not the only relevant one. Early in my career I penned a short article in which I lamented schools’ lack of investment in tefillah – time, sacred space, choice of siddurim, staffing, etc. These issues surfaced in many of the articles as well, and there is growing sense of a need for greater investment in tefillah education. For two consecutive summers, the Pardes Center for Jewish Educators (PCJE) conducted a seminar titled Aleinu L’eshabeach in an effort to begin to professionalize the field of tefillah education. Many of the articles in this issue were inspired by participants of those seminars, and the article by Susan Wall, Zvi Hirschfield, and Seth Korelitz describes the seminar, its goals, and some of its outcomes. The fundamental topic of setting appropriate goals for tefillah is addressed by Tamara Frankel*. Eliot Feldman* presents a rubric for assessing tefillah, while Lior Misrachi and Natanya Milner create a framework with which to create goals appropriate for different schools and settings. The role of the tefillah educator was another recurring theme. Jay Goldmintz and Barry Kislowicz* each address the need for the teacher assigned to tefillah to see him/herself as a tefillah educator, while Moshe Drelich presents a summary of his doctoral dissertation which analyzed, amongst other things, the role of the relationship between the tefillah educator and the students. This issue once again features Levi Cooper, who shares with us fascinating vignettes about Rabbinic responses to breakaway prayers. 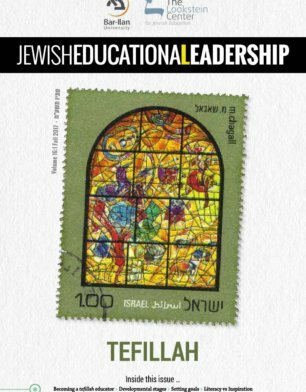 Our Perspective column is written by veteran tefillah educator Saul Wachs, whose influence is evident in many of the articles in this issue. 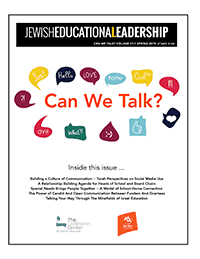 The burning interest in tefillah education is reflected by the unprecedented response to the Call for Papers for this issue. The flood of worthwhile articles was such that we have an extensive online edition which includes articles for which there was no room in the print edition. Those articles are identified by an asterisk (*) next to the author’s name, and are accessible only on Lookstein’s website.